Eye On Tampa Bay: Like we said. Now it's a $15.8 Billion tax! But in the prior months, they called it a "$9 billion backlog", or conflating the AFT amendment with the Hillsborough MPO LRTP. AFT has stated their plan was based on the MPO's 20 year LRTP. The AFT tax is over 30 years. That should have been the first clue that the Times should not have compared AFT with the LRTP. 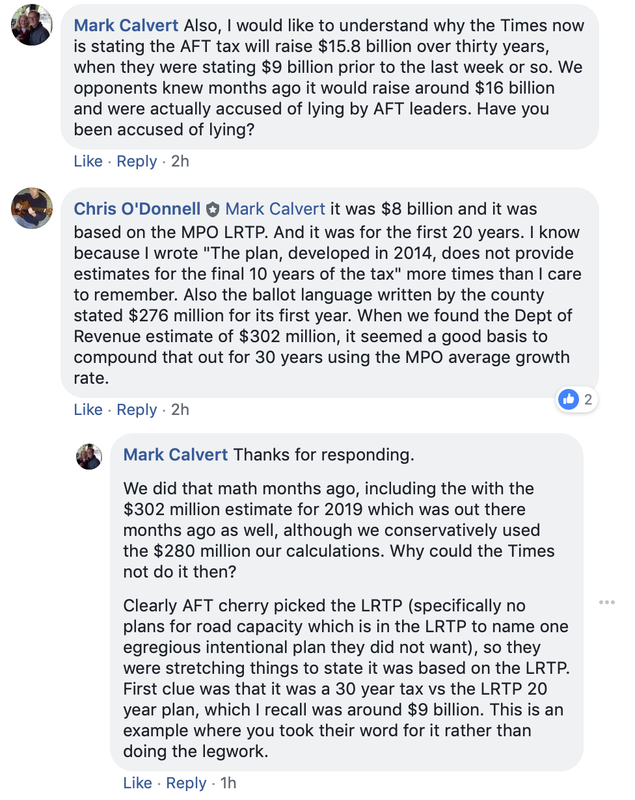 AFT obviously cherry picked their preferred projects from the LRTP for their "plan", such as restricting funding for new road capacity, while the LRTP had included $1 billion over 20 years. With the tax set to generate $9 billion or more over the next 30 years, it's essential taxpayers can be assured money is appropriately spent. The one-cent sales tax will generate $9 billion or more over its 30-year life, making a healthy dent in the county's $13 billion transportation backlog. I recently asked Times reporter Chris O'Donnell about the change on one of his Facebook posts. It was clear when the AFT amendment was published in June it was a 30 year tax. The growth assumptions are well known. They are from the MPO, the same organization whom AFT's "plan" was based on, as reported on... by the Times. Why was the Times unable to find that public information until recently. We had no problem. We wrote on multiple occasions since June the tax would raise an estimated $16 billion over its 30 year life. The numbers and assumptions were out there, and the math is not hard. Just using the MPOs growth and inflation assumptions results in $16 billion. 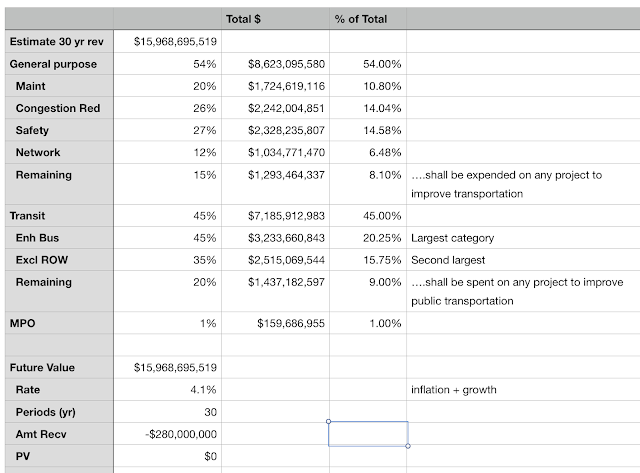 Here's a screen shot of a spreadsheet we used for the calculations and assumptions months ago, prior to the publication of the 2018-19 County and Municipal Revenue Estimates as well as the AFT spending categories break down. 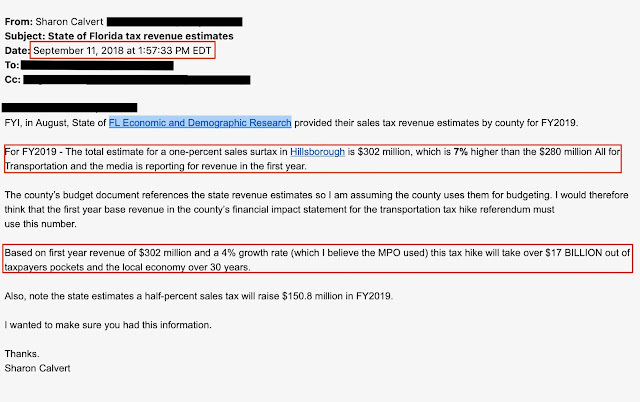 The truth is, starting with $280 million raised in year one, accounting for inflation and growth over the 30 year lifespan of the tax, the tax will raise an estimated $15 billion dollars using the Hillsborough MPO's LRTP inflation and population growth factors.You might ask why that $15 billion is never reported. This is just ONE of the facts that local media mislead the people with. Who is to blame? The people who swallowed all the lies or the people who made up and help continue them? Seems you were right about the stadium and property taxes also. Yes, the opposition was completely right about the city and county getting together and using property taxes hidden within a CRA so they don't have to have a referendum which would be required if it were City of Tampa or Hills County general revenue funds. The rail to the stadium and downtown will drive up the property values even faster than just the stadium alone. Taxpayers assume the position. The MPO should have proactively published the total 30-year tax starting with FY19 dollars when they presented the tax plan to the Tampa City Council! They were conspicuously silent on this and the fact that the pro-transit/anti-auto tax scheme entirely omitted the highway capacity spending category entirely...the only category omitted. They were complicit because they are due to reap 1% of the total...a whopping $160M. The MPO only "educated" on the positive aspects and hid the negative aspects of this plan. Hillsborough residents will be outraged when on Jan 1 when the tax is due.